Much like the boy who cried wolf, those who claim that direct DR will replace CR have found their words falling on deaf ears. While its use is changing in the United States—DR systems are replacing CR in many hospital imaging environments—CR isn’t going away anytime soon. In the United States, CR is growing in some new markets, including physicians’ offices, orthopedic clinics, imaging centers, and chiropractic and veterinary facilities. Further, Heidi McIntosh, global marketing manager for Carestream Health’s X-ray solutions, believes CR’s greatest promise lies in its ability to offer an affordable conversion from film to digital imaging in emerging markets, including India, China, the Middle East, Russia, South America, and Africa. Back in the States, smaller-volume hospital satellite facilities and imaging centers will continue to use CR because the economics of moving to DR do not make sense. Midsize and larger facilities often use smaller CR cassettes (and systems) for extremity, pediatric, and other specialized exams. Many facilities of all sizes employ CR as an affordable and effective backup for room-based and mobile DR imaging systems. Darren Werner, radiography product manager for Konica Minolta, says CR is a busy, growing area for the company. Its single-bay REGIUS Nano system can process up to seventy-six 14- X 17-inch plates per hour and features a touch screen control station. 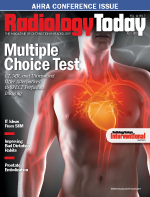 One trend Hotchkiss sees is hospitals buying physician practices that offer their own imaging. In some cases, those organizations are turning to CR systems with tabletop processors so the smaller offices can keep up with modest patient volume, Hotchkiss says. “We had a large order just nine months ago from a hospital group out west, and [CR] is still important as a backup technology. CR hasn’t gone away,” he notes. CR systems are compact, flexible, cost less than DR, and can be used in tight office and clinic spaces. In addition, some CR systems can be used for mammography, streamlining workflow and eliminating the need to maintain film and chemistry for mammography exams. Carestream seeks customer feedback and continues to invest in software features that enhance image quality, workflow, and quality assurance, according to McIntosh. The company has introduced new tools within the last six months that were developed in response to requests from health care providers, she adds. “The newest generation of CR systems offer image quality and productivity advances, and continued improvements in these areas are expected in the future,” McIntosh says. Frans Venker, global marketing lead for diagnostic X-ray for Philips Healthcare, says the company is the only large vendor with its own CR portfolio, utilizing the same back-end, user-interface, unique image processing as in DR and that can be fully integrated in the DR workflow. The top reason administrators and facilities consider CR over DR is money. While the purchase expense of DR systems has dropped, CR can still cost significantly less. Siemens does not plan to end its CR offerings, but Fernandes does believe this may change in 10 years, as the infrastructure and those with CR readers, cassettes, and other investments start to see their products wear out. Konica came out with its ImagePilot CR system, which Werner says is easy to use and integrates well with most systems. Also, with its Xpress CR Digital Mammography upgrade and its Cesium Bromide mammography plate, users are assured of high-quality mammography imaging while simultaneously achieving a lower total cost of ownership than other solutions currently available. Mammography is one important area where CR can serve well, as many organizations have widely decentralized mammography operations and the ability to transfer digital images to a mammography reading facility greatly simplifies the job compared with the alternative of transporting film to one reading site. Customers are telling original equipment manufacturers that they are ready for change but are looking for ways to bring CR and DR into one environment. — Keith Loria is a freelance writer based in the metro Washington, DC, area.